Last Thursday, 3 S4 Pupils, Hannah McFarlane, Carly McLaughlin and Zoe Rutherford, led a workshop for more than 100 delegates from third sector organisations, Educations, Local Authorities and employers at The Gathering 2018 – the largest 3rd Sector conference in Europe. The girls, who were selected to represent The Wood Foundation from more than 230 school across Scotland, gave a very professional presentation and talked confidently about their involvement in the Wood Foundation’s Youth Philanthropy Initiative and about the power of youth to give delegates a better understanding about how they can embrace young people in their organisations. Recently, 13 pupils and Ms Gordon attended the ‘Silver Lining’s event which was held at St Maurices on Wednesday 21st February, 6.45pm to 9.00pm. The event was organised by YACK (Youth Action Cumbernauld/Kilsyth) and the main focus was young people and mental health. Participants took part in 3 workshops, Reeltime music provided a practical session on drumming, Ukele playing and DJing. There was also a comedy workshop and a ‘Market Place’ where young people had the chance to chat to service providers and take part in other fun activities. It is hoped that this event will encourage young people from Kilsyth and Cumbernauld to become members of YACK, who meet every Wednesday night in St Maurices (7pm to 8.30pm), to take forward issues relevant to young people. Our Careers Fair took place on Monday 26th February in the school Café and was supported by over 30 providers from Higher and Further Education and Employers. This was a well-attended, informative event and success and we would like to thank all those who gave up their time to meet and support our young people and their parents. The Rotary Club Speaking competition takes place this week with a number of pupils from S1 – S3 involved. Good luck everyone participating. On Thursday March 8th, schools from across Lanarkshire will gather at Kilsyth Academy to take part in the annual Rotary Technology tournament. Working in teams, pupils will be given a problem to solve and provided with a limited selection of resources to encourage creative approaches to successfully achieving the specified aims. We look forward to welcoming participating Schools and pupil’s to Kilsyth. Kilsyth Academy held their annual Cross Country Championships last week with over sixty athletes competing in either the junior or senior events. This event also doubles up as one of our inter-house events which led to increased competition for every place in the field. Furthermore the organisation and management of this event is led by our Sports Leaders and is an integral part of their course, allowing them to put their impressive leadership skills into action. Junior Boys Champion; Reece Culley Silver, Matthew Carlin and Bronze Euan McCrae. Junior Girls Champion; Gracie Currie, Silver, Chloe Whitelock and Bronze Katie Carr. Senior Boys Champion; Callum Smith, Silver, Cameron Comrie and Bronze Ross Alexander. Senior Girls Champion; Jessica Curle who successfully retained the trophy from last year and has now won three years running, Silver Sophie Lynch and Bronze Rachel Thomson for the second year. There will be a second meeting on Thursday 1st March at morning interval for all athletes competing at the North Lanarkshire Cross Country Event. This will be held in the back gym and permission forms will be issued so all participants must attend. As part of our ongoing partnership with the charity Comfort Rwanda a group of senior pupils and staff will again visit Rwanda this summer. To support this trip the group are holding their main fundraiser, a Race Night, in the school cafe on Friday 2nd March from 7-10pm. Tickets are available from the school at a cost of £5 and you can get further information from Miss McKillop. We have always had excellent support from the school and local community and the money raised will make such a difference to the people in Rwanda. At present we do not have our exact project location but it will be restoring or building homes and providing live stock for community groups.As always raffle prizes will be graciously accepted. S5/6 Tracking reports are due to be issued on Wednesday 7/3/18. Our annual Burns Supper will take place on Wednesday 7th February in the school café. This event is entirely organized by senior pupils as part of their Leadership award. This year both Olivia Anderson and Nicole Lowther are leading what will be a very enjoyable event. The Parent Council met on Monday and heard directly from pupil members of our Rights Respecting Schools committee who outlined our journey so far and discussed our plans to gain Right Respecting School Level 1 status in the next year. In addition, the council discussed our progress with the Pupil Equity Fund and were updated on school issues by the Head Teacher. As part of providing some targeted work based learning we have teamed up with First Steps Training in Glasgow to provide a ten week introductory course to five young people in S3 and S4. This course focuses on the skills required in the construction industry and introduces pupils to a range of trades including brick laying, joinery and scaffolding. The pupils involved have really enjoyed the experience so far and will work with First Steps until Easter. 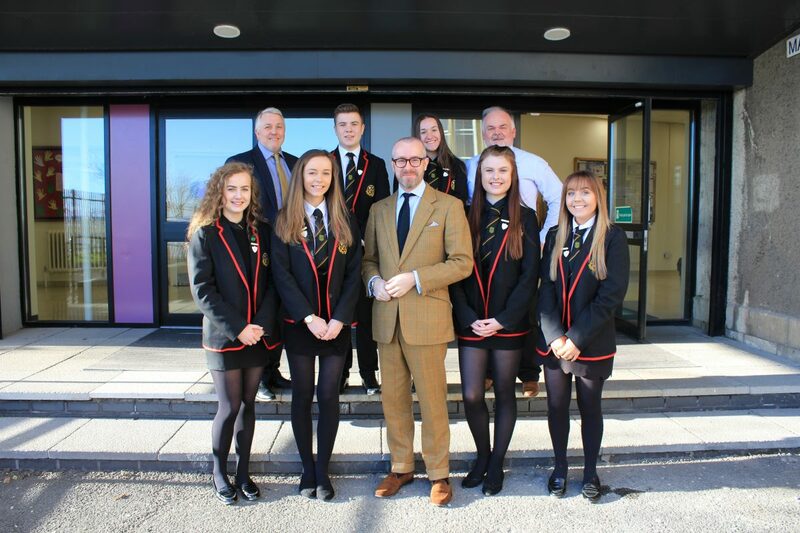 On Friday 2nd February, as part of the Peers into Schools programme run by the House of Lords, Lord Purvis of Tweed will visit Kilsyth Academy to talk to senior pupils about the work of the House of Lords and his role as a member before participating in a question and answer session with pupils in S6. This programme is designed to develop the political literacy and engagement of young people with a specific focus on the role of the Lords. Please note that the school will close for the mid-term break from Monday 12th to Wednesday 14th February. Pupils return to school on Thursday 16th.